It’s been an amazing summer here in Toronto hasn’t it? We’ve had more than our fair share of hot, humid days with very little rain. We hope you all have had the chance to enjoy enough backyard barbecues and lazy hazy Sunday afternoons on the patio. Our staff here at City Waste Services certainly have. Unfortunately, the hot, humid Toronto summer has also left a trail of foul smelling green bins and garbage cans in its wake. All those wonderful barbecues with leftover food scraps and sticky, dripping marinades have found their way onto the sides of everyone’s trash containers at home. At best, we’ve got garages full of the oh-so-wonderful summer scents of rotting garbage, and at worst, we’re cringing at the uninvited guests we find in our green bins when we open their lids. Some of us have even been seen running out of our garages halfway down our streets (no joke), but that’s probably a topic for another article and another blog. If you’re using bleach, do NOT add any other detergent, cleaners or even vinegar into the water / bleach solution. You’ll create toxic fumes that are very dangerous. Our trash containers at home have been so dirty that you wouldn’t want to touch them with a ten foot pole (like the junk in your basement that you need our garbage bin rentals for)! We’ve had to spend so much time cleaning and deodorizing our own trash containers that we picked up some things along the way and thought we’d share them with you. The noxious smells we experience walking down the street on garbage collection day (after the garbage has been picked up) tell us we’re not the only ones with the problem. 1. 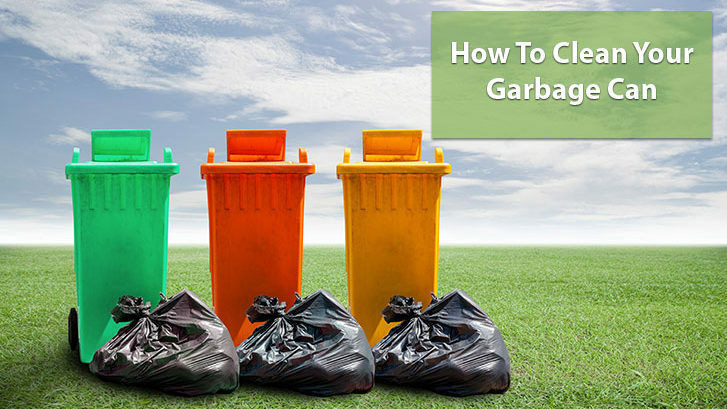 This might be obvious, but empty the garbage can of any remaining debris or, especially with outdoor garbage cans, anything that might have snuck in looking for their next meal. Put on your rubber gloves so you’re safe from contact with any harmful bacteria. You should also wear a face mask while emptying the bin so you’re not breathing in any of the potentially harmful particles that are kicked up from any critters’ “breadcrumbs” that might have been left for you. 2. Next, rinse the bin in the sink, bathtub or with your hose out on your lawn, depending on its size. Target any stubborn pieces of garbage, debris or cringe worthy critters that have gotten stuck to the walls, lid or bottom of the container. Make sure you have a spray nozzle attached to your hose because you’ll need the water pressure to shake things loose. The thumb-on-the-end of the hose trick may work to create pressure if you don’t have a spray nozzle, but if you spray yourself in the eye, don’t say we didn’t warn you. If you’ve got a pressure sprayer at home, go to town on your bin and send us your address so we can borrow it! After the pieces of last week’s barbecue are no longer stuck to the surfaces of your garbage can, empty all the water from it. 3. Now it’s time to make your cleaning solution. If you’ve chosen the chemical-free route, mix 2 cups of vinegar for every 4 liters of water in your garbage container. If, on the other hand, you’ve got some industrial strength cleaning to do, mix 1 cup of bleach into 4 liters of water. Let it soak in there for 30 minutes to make scrubbing easier. Warning! If you’re using bleach, do NOT add any other detergent, cleaners or even vinegar into the water / bleach solution. You’ll create toxic fumes that are very dangerous. Click here for a list of cleaning products you should never mix. It’s also worth mentioning that while most liquid dish soaps don’t list their ingredients, they do tell you not to add bleach. When in doubt, read the label! 4. Grab your scrubbing brush (a long-handled one, or even a toilet brush), prepare yourself to go dumpster diving and scrub! Be sure to get all those stubborn crevices, edges and the lid where dirt and bacteria tend to accumulate the most. 5. Empty the liquid from the container and rinse it thoroughly, especially if you’ll be washing it with detergent in the next step. Remember: clean bin good, toxic fumes bad. Very, very bad. 6. This step is optional; if you don’t like the strong smell of bleach or just want to be more thorough, add liquid dish washing soap to your bin and mix it with enough water to make it sudsy. Scrub the bin again, paying particular attention to the same stubborn areas as you did in step 4. 7. Empty and rinse the garbage container again. Make sure you empty all the water and if possible, let the garbage can dry in the sun, where the heat will help to destroy any remaining bacteria. 8. After the bin’s dry, spray or wipe it down with disinfecting spray and / or wipes such as Lysol to help with any lingering odors. If you have a pet, enzymatic pet cleanup products such as Nature’s Miracle are also a useful and non-toxic way to control the odors in your garbage bin now and in the future. And just like that, you’re done! If you’ve come this far, then your garbage container should be clean and odour free. To help control the inevitable smell that will come back between cleanings, add a layer of baking soda to the bottom of the bin. Just like the baking soda you have in your refrigerator, this will help to absorb odours between cleanings. To prevent the sticky, smelly liquids and other substances from leaking into your garbage can at all, be sure to use quality garbage bags that won’t break. Unless you have a particular fondness for dumpster diving and toilet brushes, that is.